The exhibition consists of thirty enlarged contact sheets printed as oversized hanging images. 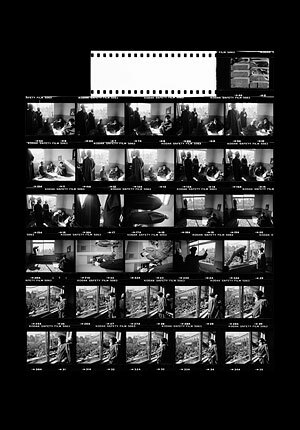 The contact sheets are supported by 30 "Icon" images corresponding directly to the contact sheets. 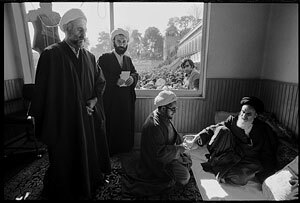 The exhibition is supported by 42 single images, which represent a chronological photographic history from events covered since the inception of Contact Press Images. 42 Additional Images: 50 cm x 60 cm (20" x 24"). 3 crates, roughly 28in x 28in x 28in, with wheels and handles for the single images. And 2-3 large tubes for the oversized contact sheets. The exhibition requires linear spaces between 55-80 meters (180-260 feet). It also requires high cielings for the hanging contact sheets (15 feet minimum). If printed locally, the exhibition can be tailored to the specific needs of a venue. • Contact Jeffrey Smith for fees. Transportation, insurance, publicity, posters, invitations and opening event are not included in the fee. The curator must be invited by each venue to supervise the hanging of the show.